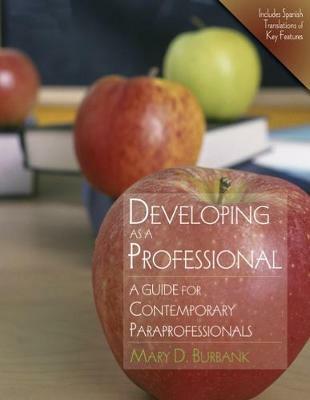 Developing as a Professional: A Guide for Contemporary Paraprofessionals provides a general orientation to the role of paraprofessional or teacher s aid. This book provides strategies for working with students receiving special education services, and communication and mentoring suggestions for those working directly with paraprofessionals. The book addresses the specific needs of paraprofessionals working in classrooms with English language learners, and each chapter includes a segment of Spanish translations for native Spanish speakers. The real world voices of two paraprofessionals, Tracy and Maria, provide paraprofessionals with perspectives much like their own. Current issues in education, policy, and practice are discussed through the stories of these individuals, and their journey invites readers into the education profession using an approachable, realistic format. A key component of each chapter includes assignment linkages to the PRAXIS standards with a section highlighting artifacts paraprofessionals might generate for their portfolios. The book also provides preview questions and vocabulary checklists as well as worksheets and activity ideas. Now more than ever, those employing paraprofessionals are in need of professional development resources that are current and reflect the changing work responsibilities of paraprofessionals and the communities in which they work. Developing as a Professional: A Guide for Contemporary Paraprofessionals is designed to meet the needs of those working as paraprofessionals as well as those employing and mentoring them. Paraprofessionals, and mentors as well as principals and administrators too, would benefit by looking at paraprofessionals role and contributions form their viewpoint. Text would contribute to greater clarity in communication. Good development, from general to specific (more elaboration on specific concepts to meet the need of the paraprofessional audience), from guidelines to application from past to present and beyond. The people who will benefit the most from this text will be potential paraprofessionals, their immediate education supervisors, and seasoned teachers. Additionally, superintendents and even parents may be enlightened by the text. Paraprofessionals would gain a higher degree of professionalism by having this text as their job description. This text should be part of every undergraduates education at teacher colleges. It may also be made available to high school seniors as an introduction to the field of educational paraprofessionals. The authors writing style is conversational in approach, easy to understand, geared for translations, and usable by adults with limited English proficiency.